Lab Supply is happy to provide our customers with a great selection of enrichment treats for guinea pigs in our online store. Timothy Hay Cubes are a great snack for your guinea pigs. These bales are made from 100% sun-cured timothy hay and this helps the guinea pig with their digestion process. 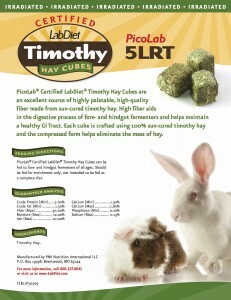 Timothy Hay Cubes can be used therapeutically for guinea pigs when they are used as a routine supplement. These cubes are irradiated, which means that they have been exposed to gamma rays to eliminate contaminants found in fresh hay. Timothy Hay Cubes are a great inexpensive and healthy guinea pig enrichment treat. If you are interested in Timothy Hay Mini Bales, then please click here to view more information on this product from our online store. Here at Lab Supply, we are committed to making sure you find exactly what you are looking for. If you have any questions about the Timothy Hay Cubes that we offer, then please click here to visit our contact page. We will be more than happy to answer any questions you may have.